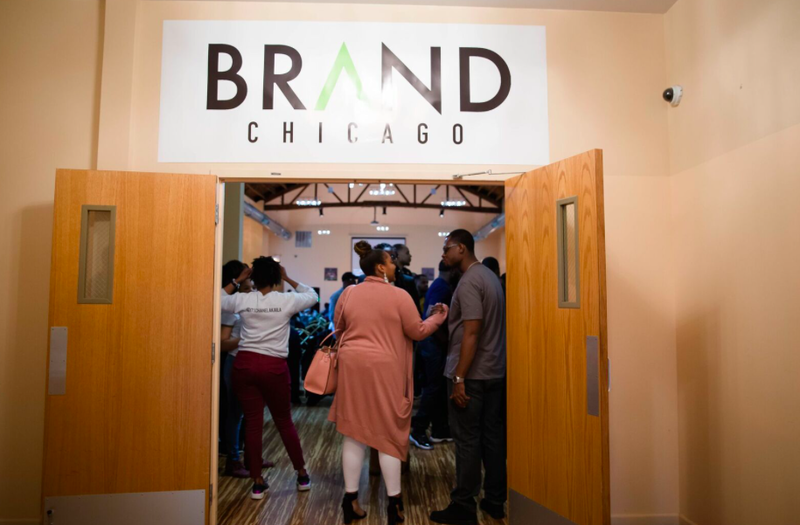 On Saturday, April 29th, more than 100 of Chicago's most ambitious multicultural entrepreneurs, side hustlers, and young professionals gathered for a premiere branding experience hosted by brand consultant and creator of Brand Chicago, Brittany Applegate. Brand Chicago armed each attendee with the tools, cool insights, and strategies needed to develop and manage oneself, side hustle, or business. We started off with the fundamentals of branding, and turned things up a bit...well, a lot so that each individual walked away with everything they needed need to build, launch, and grow your personal brands and businesses. Including new headshots. A carefully crafted lineup of killer keynotes, presentations, and networking opportunities with peers and branding gurus who contributed to building major brands like Nike Chicago, BET, Amika, Target, Unilever, MillerCoors, Corona. and even our beloved, Barack Obama heightened this creatively collaborative experience. Check out photos and recaps below. Last weekend, Donda’s House was invited to attend this exclusive event here on the South Side of Chicago called Brand Chicago. Brittany Applegate, the founder of Brand Chicago opened the sold-out event with an inspiring talk called “The Brand Foundation” about how we are given our gifts to give them away. This is the first offering of Brand Chicago which aims to empower emerging creatives in Chicago with marketing tools. Read more. Hex Hectic and Kelsey Riley represented Donda's House at Brand Chicago. Visit website DondasHouseInc.org and click "News" to learn more. Video directed by Hex. Saturday, April 29th was a gloomy and rainy one in Chicago but gave even better reason to stay inside to soak up some knowledge to answer those burning questions. A new and refreshing take on the standard day-long conference, Brand Chicago featured some of the city’s best and brightest young Black influencers who dropped major gems on an eager packed house of budding and aspiring entrepreneurs. Read More. There was a strong, consistent sense of community that helped to make the event what it was. The room was full of support and collaborative energy. Many people from the audience had attended the same university and had known each other for several years. A handful of attendees had participated in a group fitness class with a personal trainer who was in attendance. Nearly everyone in the room could share one story or another of story of how they had come to know Brittany Applegate, whether directly or indirectly. It felt like there was an unspoken "I see you sister/brother" that I observed in each conversation and interaction even before the event began. brand chicago recap by the brkn co. Hosted at the LightHouse located on Chicago’s Southside, Brand Chicago was a packed and sold out house. Instantly, I was greeted at the door and the energy took full effect. Creatives, hustlers, serial entrepreneurs, media teams, freelancers and dream chasers were all in attendance to engage with a heavy hitter line up. Read More. Saturday was a rewarding experience...One of my good friends, Veronica Appleton was on the Power Panel as well as a vendor with her corporate team from We Are Unlimited. Another good friend, Femi Masha who is an intellectual property lawyer was there to give us a crash course in preparing proper trademarking process. I even had a magical moment when I realized I was sitting next to Britney Robbins of The Gray Matter Experience. Read More. As Brittany would put it, we’re living in a world where it’s the survival of the LITTEST... While each session discussed a different aspect of branding, two themes became clear throughout the day: introspection and consistency. Before you can build a brand, you have to get to know yourself. Branding will always be a chore or a tedious task when you haven’t taken the time to get to know yourself or your abilities. Read More. To kick off the event, Brittany began by laying the foundation of effective branding. Highlighting points such as connecting the dots (aka story telling), brand strategy, visual and verbal identity. Under her concept “Survival of the Littest” is where we’re first introduced to the idea of consistency. Here she highlights the combination of consistency and focus, to emphasize the impact these have on developing and sustaining a brand. Read more. From there the event took off with back-to-back experts who carefully detailed the steps to build a solid foundation for brand hopefuls. Brand Chicago took a proactive stance on providing users essential guidelines of brand building including how to trademark your brand as well as highlighting the importance of utilizing insights and analytics to differentiate brands from their competitors.. Read More. Beyond providing tangible takeaways that attendees could actually implement in building their brands, including website design, identifying your brand market and analyzing insights, and the legal steps needed to protect your brand, Brand Chicago offered a really diverse panel of speakers with proven successes in their various fields (this is always key), further validating the insights they offered throughout the event. Read More. As an entrepreneur, the two things I never have enough of are time and money. Everything is an investment. Earlier today, my team and I attended Brand Chicago and it's already paying dividends. Brand Chicago is the brainchild of brand consultant Brittany Applegate. Read More.